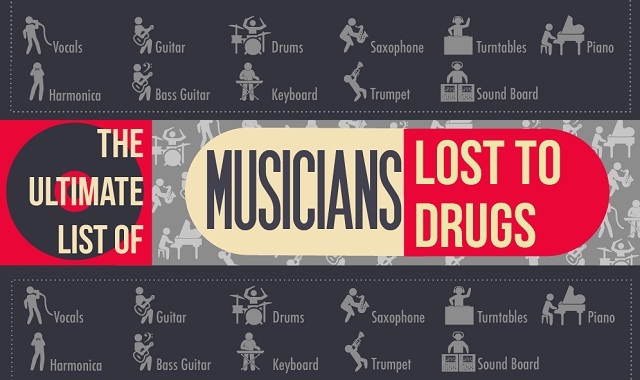 The Ultimate List of Musicians Lost to Drugs #infographic ~ Visualistan '+g+"
From the mind-expanding music of the 70s to the punk scene of the late 80s to modern times, rock and roll has lifted us up as a culture, giving us entirely new perspectives and providing new modes of communication. Whether you’ve done the twist to Elvis’s rock at a school dance, created a mix tape of the Ramones to confess your love to your first crush, or played air guitar to Jimi Hendrix to lift up your mood, you’ve probably enjoyed the music of someone who’s died from overdose. Whether it’s because of the the hard-and-fast rock scene or the need to “expand one’s mind,” drugs and rock and roll have been intrinsically tied since the 60s. Unfortunately, that means that many people have died from either overdosing or from complications resulting from hard drugs like heroin, barbiturates, alcohol, prescription drugs, and cocaine. White Sands Treatment has compiled a list of jazz players, rockers, and musicians who’ve all died from drug problems.